Isaiah, Martin, and Cody celebrate a sucessful repair! This was a busy day for Shifting Gears. I taught a 2 hour basic bicycle maintenance class at the Rail River Folk School this morning. Six students attended and we had a good time talking tool, tires, and tuning. The school is a perfect setting for a class like this with its big central room and historic warehouse ambience. A bonus was the Art from Within show on display. Folks seemed hungry for more so watch the home page for more opportunities to learn how to keep your bike running smoothly. 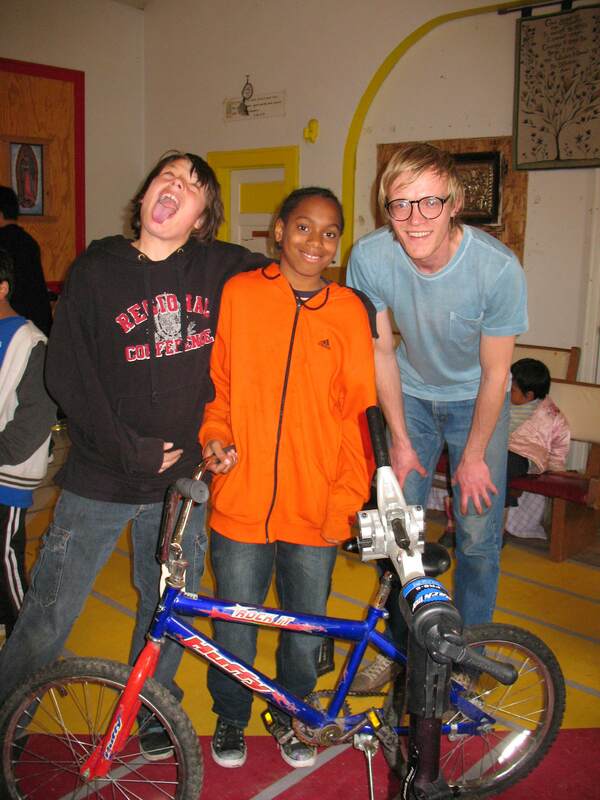 We finally pulled off a kids bike clinic at Peoples Church. On arrival it was drizzling and then began to snow. We started to set up the stands inside the church. A few minutes later the sun was out and we moved outside only to go back in when the sky darkened. The sun came out again but we held tight, a good thing since we missed getting hailed on! Despite the weather a dozen kids got bikes and we fixed another half a dozen. The pictures say it all. Many thanks to Cody, Chris, and Thomas who did the lion’s share of the repairs! We just keep on passing it forward!